Whether it’s summer or winter, whether you’re doing it yourself or hiring a professional to do it, whether you’re laying it down in blankets and batts or spraying it loose, there’s never a better time than right now to upgrade the insulation in your attic. You may not even be aware you have a problem; even if you laid down the insulation in your attic yourself, changes in weather conditions, airflow and moisture can affect insulation efficacy over time. If you bought the home you’re living in now without checking the insulation first, you could be in for even more nasty surprises. Fully 60% of the heat that leaves your home travels through the walls and roof if they’re not insulated properly. Though you have plenty more options than ever before as a homeowner properly insulating your attic, the one most folks use is still proving to be the best: good old fiberglass. 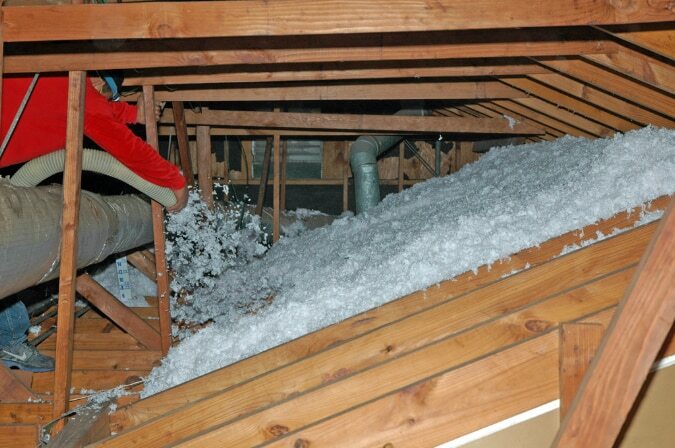 Whether laid down in blankets the old-school way or blown into the nooks and crannies of your home by professionals, fiberglass attic insulation has been proven to be the single greatest home improvement you can make when it comes to your wallet. The return on investment with fiberglass is greater than any other: over 107%. That means whatever you spend will be doubled when and if you decide to sell your home. However, there’s still a lot of confusion about fiberglass, especially as compared to some of the newer substances on the market. So let’s take a look at what it is and why it’s still the choice for 85% of homeowners. Cellulose, mineral wool, and even cotton (from denim!) have been spun into insulation in the past few years. But when you compare their various insulating properties and contrast that with their cost per inch, fiberglass always comes out on top. Mineral wool and cellulose will cost more than fiberglass, and cellulose has issues with rot and mold that fiberglass does not. Because it’s literally made out of what its name implies — silica and other fine glass materials, stripped into fibers — fiberglass is incredibly flexible and can be manufactured any number of ways. It works because it’s got millions of natural air pockets between the fibers that trap heat and keep it from escaping. It can also be manufactured to be as eco-friendly as any other material when made from recycled glass. It’s also a great natural sound buffer, resisting sound waves better than any other insulation material except cotton… and unlike cotton, insects want nothing to do with it. The advent of “blown-in” insulation has removed most of the problems that classic fiberglass installation brought with it. Do it yourself means you won’t have any of that fiberglass itch because you won’t have to touch it, but even better is the way that blown-in fiberglass settles thicker and denser than just laying down the regular blanket kind. There’s no shrinkage in the winter months, and no need to cut special pieces to lay down in oddly shaped areas or crawlspaces. While fiberglass doesn’t burn, its vapor protection backing does… but when it’s blown in, you get natural vapor protection without any threat of flammability at all! Because it’s made via a process that allows for a lot of flexibility in manufacturing, fiberglass can be made to any R-value you need. R-values are the government-regulated measurements that determine how effective home insulation can be. The Department of Energy suggests R30 or more for homes in a hot climate to R49 as a minimum for very cold climates. Houston, having one of the largest swings in temperature of any major American city, making having a high R-value important in your insulation. Remember: In insulation, R-value does not measure its thickness, but rather it’s heat resistance. And that’s not something you can judge with your eyes. Fiberglass itchiness has long been a problem associated with the product, which is why you’re supposed to wear masks, heavy gloves, and work clothes when you install it. But it can still irritate even if you have someone else do it. Fortunately, these days fiberglass doesn’t use formaldehyde as a binding material the way it used to. Modern fiberglass is manufactured with a binding agent that’s natural and plant-based. Even if you have to interact with your wall or attic insulation at some point, you don’t have to be careful about breathing it in or touching it. Cellulose seems like a better option for many homeowners when it comes to their insulation because its R-value can be higher when blown in: 3.2 – 3.8 per inch vs 2.2 – 2.7 per inch for blown fiberglass. When blown in, however, the Department of Energy assigns a 1% settle rate to fiberglass. Cellulose can settle by as much as 20%! That wipes out your R-value, and more of your bank account, because cellulose costs more to install. Old-school fiberglass, laid down in batts, was well-known for lasting 10 to 15 years without replacement. The good news is that the new blown-in fiberglass has a similar life span. Those numbers take into account the tendency for old-fashioned batt or blanket fiberglass to sag or settle, get clogged with dust, and collect moisture over a long period of time. Blown-in fiberglass, on the other hand, reduces most of those issues — and even an old-fashioned blanket installation of fiberglass, when properly maintained, has been known to stay functional for 80 to even a hundred years! The costs of replacing your old insulation are lower than ever, and the benefits are higher than ever, with most of the old drawbacks of fiberglass insulation having been weeded out by the industry. It only makes sense to use spray-on fiberglass as your insulation choice… and you can make your insulation last even longer with additions like attic tents and radiant barrier foil. Get that old insulation removed today and replace it with the latest in fiberglass technology. Watch your bills go down… and your asking price go up!